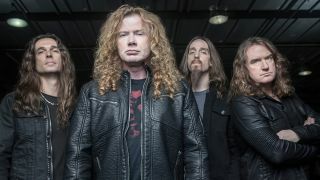 Dave Mustaine says he has “about eight songs” ready for the new Megadeth album. They’ve been working on the follow-up to 2016’s Dystopia since last year, with one of the tracks tentatively titled The Dogs Of Chernobyl. And in a new interview with Music Radar, the guitarist and vocalist says they still have more surprises up their sleeve. Mustaine says: “Whenever I’ve been home, I’ve been working on new music from 10 in the morning to seven at night. “My co-producer Chris Rakestraw from the Dystopia team has been helping with pre-production on songs. I have about eight songs and there’s one which is just unanimously everyone’s favourite, which is great. Mustaine adds: “We’re going to do 12 or 13 tracks this time. My contract says I’m only supposed to do eight songs a record and I just can’t do that – it feels like cheating. “When I grew up listening to vinyl, it was a lot easier to buy a record and be happy with 45 minutes of music. When the digital world came, the paradigm changed – a musical offering needs a lot more. Megadeth will release their new compilation album Warheads On Foreheads this coming Friday (March 22) and recently revealed they’d mark their 35th anniversary with a new graphic novel titled Death By Design.